My fighter is female Coach. Demetrio Reyes 14/106/open if you are interested in matching up. I have a 8yr / 57 / 0 bouts if you’d like to match with your 9/2/60. Hello Coach Zack, he will not be avail for this event, parents out of town in Vegas, we can do another event just let me know. /May have a match for your boxer, Efren Diosdado. My boxer is 17/165/8. Anybody want to match up? I have a fighter 16yrs old 132lbs with only 2 fights. Hello, I have a 17/135/1 bout kid we can match with your 16/132/2 bouts kid??? Call me at (409)996-1190 and we can discuss agreements. Thanks and God bless. Hi coach would you like to match your male 19/4/125-132 with my 25/8/130 fighter? Hey coach, I have a guy that is 24/130-132/2fights , do you have anyone I can match him up with this weekend? 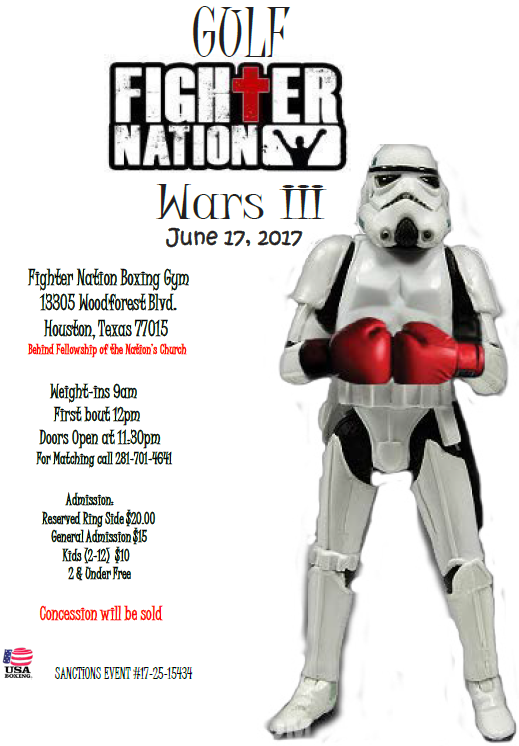 Do you want to match up for June 17th? I have a guy that is 24/132-135/2 fights?